Thomas Jefferson called Monticello his "essay in architecture." Reflecting the genius and versatility of its creator, Jefferson's Monticello is a monument to a scrupulous interest in architecture, landscaping, agriculture, and domestic comforts. The remarkable house, one of America's most famous, is filled with ingenious devices and mementos of this revered founding father. The author of the Declaration of Independence and third President of the United States, Jefferson studied buildings in ancient Rome and began his dwelling atop the "Little Mountain" where he had played as a boy, after leveling the top in 1768. Palladian-influenced tripartite form with two-level porticoes. After seeing the work of Boullée and Ledoux in France, he returned to Monticello with his head full of new ideas, above all, about its dome, and an aversion to grand staircases, which he believed took up too much room. When an extensive revision was finished in 1809, it had become a 21-room amalgam of Roman, Palladian, and French architectural ideals, a unique statement by one of history's great individuals. 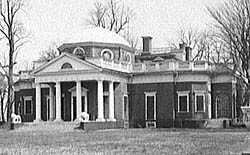 The Thomas Jefferson Memorial Foundation has maintained Monticello as a place of pilgrimage for millions since 1923. Jefferson's attention to garden design paralleled his interest in architecture. Both ornamental and vegetable gardens, as well as two orchards, a vineyard, and an 18-acre "grove," or ornamental forest, were included in his landscape plans. Jefferson's detailed records and recent archeological discoveries have made possible an accurate recreation of his gardening scheme. Since 1987, Monticello has included the Thomas Jefferson Center for Historic Plants. Monticello, a National Historic Landmark, is located in the Virginia Piedmont about two miles southeast of Charlottesville, Virginia, off of State Rte. 53. Open daily 8:00am to 5:00pm March-October, 9:00am to 4:30pm November-February, closed Christmas Day. Tours of the house and gardens available March-October. House tours offered daily; seasonal outdoor tours offered March-October. There is a fee for admission. Call 434-984-9822 or visit the website for further information. 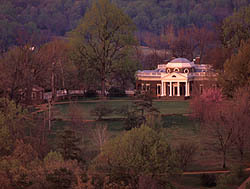 Monticello is also a designated World Heritage Site. You can also download (in pdf) the Monticello National Historic Landmark nomination.